Can we always trust professional helpers? Unfortunately we cannot. 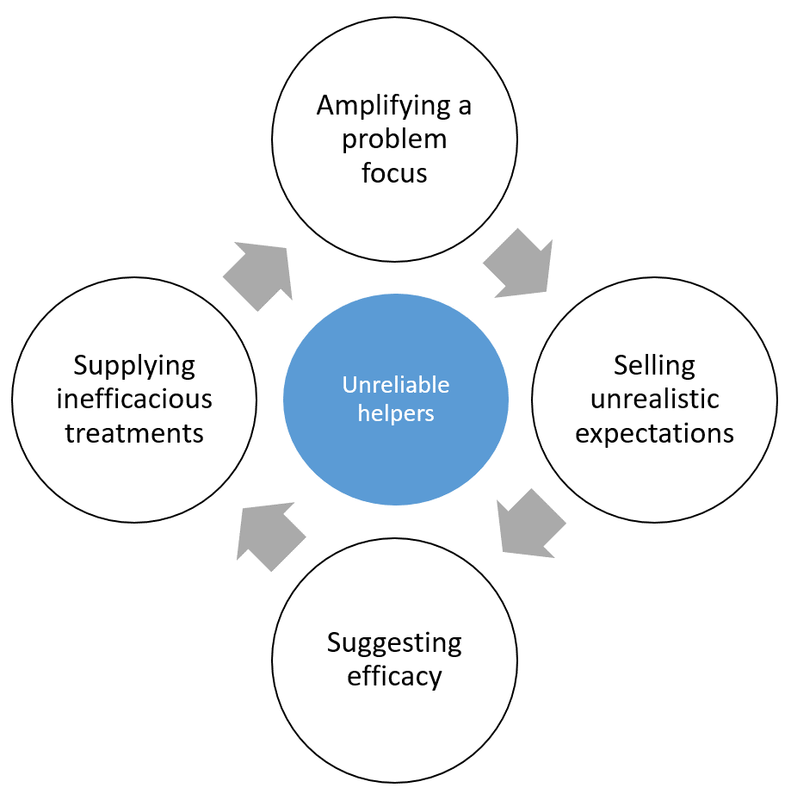 Suppliers of help can even harm us when they tell persuasive stories and supply us their treatments. They might do this with the best of intentions and they may actually believe in their treatments. But there may also be cynical and unreliable suppliers who knowingly sell us ineffective and even harmful treatments. Let's look at how people of the latter category, these unreliable helpers, might work. I think, in essence, they do four things. First, these people can do some things which implant in us the feeling that we need help. There are roughly two ways of doing that. The first way is to focus our attention on symptoms and problem causes. For example, a coach might ask lots of questions about what goes wrong in our life, in what ways we notice this, and what all of these things say about us and our life. This process is sometimes called problem induction. By focusing our attention on these sorts of things we can soon begin to think that there something seriously wrong in our life and that we need help. The second way to make us feel we need help is to sell us certain idealistic expectations. For example, if someone persuades us of the idea that focus on attaining and experiencing happiness in our life we can become more conscious of how happy we now are and that idealistic goal. We can start to feel that something which is achievable and important in our life is missing and we may become more receptive for help. The more idealistic the expectation is which someone sells us, the 'better' because the more likely we will think we need help. Once we have become receptive to the idea that we need help, phase two kicks in which is about the treatment which should be helpful. The first thing these unreliable helpers will do is to suggest that this treatment is efficacious. For example, if they have first made us believe that we should be happier than we currently are they can offer us a service or product (therapy, coaching, training, pills, etc.) which promises us to make us happier. On a side note: searching for happiness can be bad for us. It can make us unhappier and more lonely. The last step is the most surprising and cynical step. 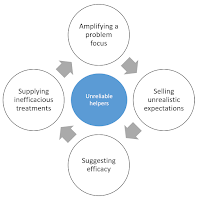 The treatment which unreliable helpers supply us should not be effective. How is this possible? How can it be that people can be tricked into using methods which do not work? Research by Tanaka (2009) demonstrates how this is possible. His research shows that methods which do not work may spread faster than methods which do work. The explanation is that we often imitate other people's choices. When we see someone take some treatment for some kind of ill, it will become more likely we will try that same treatment when we will have that same ill. The surprise is: the most effective treatments will be used for the briefest period of time. When they work well, the ill will be over soon. Ineffective treatments will not solve the problem quickly. The problem will remain and we will keep thinking that we will have to continue undergoing the treatment. Perhaps we will even think we will have to increase its dose. I think most professional helpers have good intentions. But there are also scammers. For their own gain, they offer us help which does not work and which we may even need. We may us this description of these four steps to protect us from these swindlers. We could become slightly more on our guard when (1) someone asks us lots of questions about everything that goes wrong in our life, (2) when someone tries to persuade us that our life should be much better than it is now, (3) when someone tries to sells us some treatment which we, at first, we did not even think we needed, (4) when there is no evidence for the efficacy of this treatment.